As part of the CNY celebrations, Tsai Chin (蔡琴) flew in for a two-night concert at Star City's Lyric Theatre. For those who haven't heard of Tsai Chin, where have you been all these years? Tsai Chin is this ultra-famous singer from Taiwan. 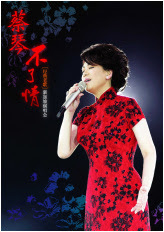 Her Chinese and Taiwanese songs transcends generations and her career spans decades. If you ask me, I would say she's second only to the great Teresa Teng. Anyway, when I first heard she's coming, I immediately checked with my parents if they want to go. Nope, heard it, no need to see it. On the other hand, GF's mom's curiosity got the best of her, so she asked GF and me to accompany her. We met up after work at Star City, and had our pre-concert dinner at the nearby City Noodle Cafe. Naturally I paid for the meals, as it's the least I can do. By the 8:30pm, the whole of Lyric Theater was packed to the rafters with Asians. When Tsai Chin emerged onto the stage, she was greeted with enthusiastic applause from the crowd. It's not everyday you see a living legend perform. The concert programme was broken into four sections (each one requiring a costume change). The first is called Shanghai Era. She sang songs from the time of Zhou Xuan (周璇) and Bai Guang (白光). Some I've heard before, some I can't remember. Next is the Hong Kong Era. She sang a medley of Chinese songs that were remakes of English ones - switching from one language to the other. She also sang Lui Wen Zheng's San Yue Li De Xiao Yu (Light Rain in March). For the Taipei Era, she sang Taiwanese folk song Night Song of the Green Island (綠島小夜曲), the haunting Bu Liao Qing (不了情), and the catchy Ye Lai Xiang (夜來香). For the encore (a.k.a. the Tsai Chin Era), she sang her trademark songs like Du Ni (讀你), Jin Xiao Duo Bao Zhong, and Cia Si Ni Di Wen Rou (恰似你的温柔). For her very last number, she said she brought along two newcomers from Hong Kong to sing with her. A video flashed on the stage backdrop, showing a snippet from Infernal Affairs (無間道). Andy Lau and Tony Leung were at the audio shop testing out the tube amps and speakers using Tsai Chin's Bei Yi Wang De Shi Guang (被遺忘的時光) as test song. The video was paused, and the live Tsai Chin continued singing the song from the movie. Very nice touch. I've said before that I prefer classical concerts because all you need to do is sit back and appreciate the music. With pop concerts, people clap at inappropriate times, sometimes made to do strange things by the singer, sing and/or dance along to the music, etc. Tsai Chin's concert is an exception because she handled the crowd pretty well. Thoroughly enjoyed ourselves.